When the National Hot Rod Association makes its annual trek to California�s wine country for the 18th annual NHRA Nationals, Tony Pedregon and the Q Racing funny car team will be in colorful company as the cast of the summer hit film, Madagascar, climb aboard for one wild ride at Infineon Raceway on July 29-31, 2005. DreamWorks, Pedregon Racing, Q Racing and Action Performance Companies Inc. united for the special Madagascar program, which also included NASCAR� drivers Tony Stewart and Bobby Labonte. Pedregon�s nitromethane-fueled Chevrolet Monte Carlo funny car will feature the film�s four principle characters: Alex the lion, Marty the zebra, Melman the giraffe and Gloria the hippopotamus. "Combining a promotion such as Madagascar and the NHRA helps promote the idea of parents spending time with their kids," Pedregon explained. "They, kids and parents, instantly connect with the film�s characters when they see the car. My own daughter insisted I see Madagascar twice, and I think I enjoyed it as much as she did." The movie/drag racing connection is nothing new to Pedregon, who has piloted several feature film-based specials throughout his career, including a Shrek 2 special for DreamWorks in 2004. "More and more, families are discovering the camaraderie and adventure offered by a day at the drag races," said Fred Wagenhals, Action Performance�s chairman, president and CEO. "As that atmosphere continues to thrive, these sorts of specials, which bring in distinctive, family-appropriate fare such as Madagascar, become a welcome sight at the drag strip. And, since Tony Pedregon is one of the most popular and talented drivers on the NHRA circuit, it only makes sense to bring Madagascar to the track with his Q Powered funny car team." Action Performance Companies, the leader in licensed motorsports merchandise, designed Pedregon�s Q Racing/Madagascar Chevrolet funny car. Action also produced die-cast replica versions of the limited edition Madagascar machine. 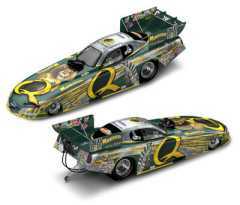 In addition to its unique paint scheme, each Q Racing/Madagascar funny car comes in a special theme package. Pedregon�s Madagascar funny car and the NASCAR stock car versions are available through Action�s standard distribution channels. To reach an Action Racing Collectables distributor, call the locator line at 1-800-411-8404 or use the ARC dealer locator tool online at www.action-performance.com. Racing Collectables Club of America, a members-only collector club, can be reached at 1-800-952-0708 or on the Web at www.goracing.com. DreamWorks Animation�s Madagascar is a computer-animated comedy starring four civilized animals � a lion, a zebra, a giraffe and a hippo � who have lived their entire lives in blissful captivity, growing up as best friends at the Central Park Zoo�until the day they are put on a boat to Africa and suddenly find themselves washed ashore onto the exotic island of Madagascar. Now, these native New Yorkers must learn to survive in this strange land and discover the true meaning of the phrase, "it�s a jungle out there." DreamWorks Animation SKG (NYSE: DWA) is devoted to producing high-quality family entertainment through the use of computer-generated (CG) animation. Utilizing world-class creative talent and state-of-the-art technological capabilities, the company is committed to making two computer-animated feature films a year that appeal to a broad movie-going audience.